Sufferers of tinnitus and other hearing disorders have had virtually no proved treatment options. That’s because the inner ear is one of the most inaccessible places in the human body—a bony, membrane-lined labyrinth measuring only a few cubic millimeters. These tight quarters make surgery all but impossible. “We can operate in the heart, in the brain, even inside the eye—the only place where we can’t operate in a functioning organ is the inner ear,” saysRobert Jackler, a Stanford University School of Medicine otologist–neurotologistwho specializes in complex ear diseases. The tiny space has also thwarted most attempts to develop and deliver drugs to treat hearing disorders, whether brought on by aging or exposure to loud noises. Such tiny amounts of fluid are needed, with even more finely tuned quantities of drugs, that attempts to dispense medication over long periods of time have failed. “We’ve tried directed medication when treating hearing disorders but the way we do it today is very imprecise and poorly calibrated,” Jackler says. Listen carefully, though, and a slow, steady din of progress in materials science and bioengineering can be heard gathering momentum to help those suffering from a range of debilitating auditory ailments. Two systems, in particular, are gaining a lot of attention: one that infuses a little polymer matrix with drugs to stop relentless ringing in the ears and one that uses a miniscule pump to deliver the goods to damaged hair cells, or cilia, that cause hearing loss. Researchers at the Charles Stark Draper Laboratory in Cambridge, Mass., are now testing a tiny polymer matrix that can be loaded with chemical compounds used to treat inner-ear diseases. Whether blended with an existing but limited treatment such as the anesthetic Lidocaine or some as-yet-undiscovered drug, the polymer would be injected into the middle ear and remotely triggered to release its payload into the cochlea, the fluid-filled tubular organ in the inner ear that enables us to hear. The Draper scientists are working with biomaterials scientists at the Massachusetts Institute of Technology’s (M.I.T.) Langer Laboratory—headed by bioengineer Robert Langer—to develop the matrix, made of a biodegradable gel that would harmlessly dissolve after use. The polymer might last for weeks or even months, releasing drugs into the inner ear that block the excessive release of certain neurotransmittersassociated with tinnitus or calm any hyperactive nerves found in the cochlea. The U.S. Department of Defense originally commissioned the Draper project in 2012 to help the more than 40 percent of all military veterans suffering from tinnitus—a perceived ringing in the ears—caused by exposure to a variety of loud noises, including concussive explosions, the clamor of large engines and artillery fire. The company’s marching orders from Defense were to create a small delivery device that could be inserted near the membrane-covered window that separates the middle ear from the inner ear, which is no more than three millimeters in diameter. Precision drug delivery is crucial, so one of the main challenges is engineering the matrix so that it releases its payload gradually, in a pulsating fashion. “The classic problem is how [to] get a local delivery source that distributes over a long period of time,” Borenstein says. 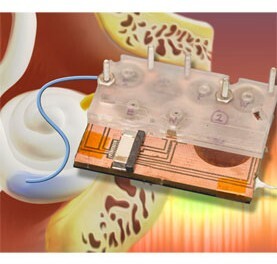 “We want our device to be able to treat a problem for months if needed.” The idea is for a person suffering from a balance disorder or tinnitus, for example, to carry a wireless remote control with them and simply tap a button to release a therapeutic drug whenever the symptoms—whether disorientation or ringing in the ears—become unbearable. About 50 million people in the U.S. experience some degree of tinnitus, which is often the result of hearing loss, according to the U.S. Centers for Disease Control and Prevention. For about 16 million of these people, the tinnitus is severe enough for them to seek medical attention, and about two million patients find themselves unable to function on a daily basis as they did before the problem began. “Although very few people actually suffer from ringing in the ears to the extent that it keeps them awake at night, tinnitus is a hearing disorder that we don’t really have many solutions for,” Jackler says. As a result sufferers of severe tinnitus are often prescribed antidepressants, which Jackler says do not eliminate the problem but rather help alleviate some of the associated anxiety and depression and help people better cope with their discomfort. Other hearing afflictions that likewise result from the death of sensory hair cells in the inner ear can be even more debilitating than tinnitus, such as permanent hearing loss. The inner ear typically has thousands of these minute cells with stereocilia that vibrate in response to sound waves. When these cells are damaged or killed, it affects the ear’s ability to sense sound waves and turn them into nerve impulses that communicate with the brain. Another Draper project—this one funded by the National Institutes of Health—is examining that very problem. Draper is working with Massachusetts Eye and Ear’s Department of Otolaryngology, and Harvard Medical School to create a head-mounted microfluidics-based system—a micropump—that delivers medicine to and samples fluid from the inner ear. Such a retrieval or sampling system would be a significant breakthrough because it would enable biotech and pharmaceutical companies to measure the concentration of medication that makes it to the cochlea, where the cilia cells reside, says Borenstein, the project’s principal investigator. Borenstein and his colleagues ultimately want to create an implantable—as opposed to head-mounted—device that can also accelerate the drug development process. Their primary challenge, as they describe in the February edition of Biomedical Microdevices, is getting the medication to infuse into the ear fast enough and in sufficient volume to treat the problem, without allowing too much fluid to enter the inner ear too quickly and cause damage. The cochlea only holds about one drop of fluid. A micropump would address this problem by withdrawing inner-ear fluid, mixing in a medication and then returning this mixture—without expanding the volume of fluid. The researchers have thus far fabricated and tested a simplified micropump and used it to demonstrate the flow of fluid into and out of the device, the ability to store drug in a reservoir on board, and the infusion of drug into the cochlea. Now they must miniaturize the electronics so the device—including its pump and drug reservoir—is small enough to fit into about seven or eight cubic centimeters of space available in the bony space behind the ear. The researchers have already tested their existing device in animal models as part of preclinical trials and would like to move to clinical trials within three years. Although in its infancy micropump development over the past decade has given researchers the opportunity to study the infusion of very miniscule amounts of fluid into the inner ear, Jackler says. If Draper and others developing such micropumps are successful, they will have created a platform for delivering cells and chemicals to the inner ear that could help with hair-cell regeneration and fight inflammation, he adds. Novartis has been working with biotech firm GenVec since 2010 on a clinical trial to study the latter’s gene therapy to regrow the cilia hair cells. The success of their work ultimately depends on a highly miniaturized intracochlear drug delivery system that can pump precise volumes of fluid into the cochlea in a highly controlled manner as well as remove excess fluid.